The early Polynesian settlers to Hawaiʻi brought sugar cane with them and demonstrated that it could be grown successfully. Sugar cultivation/processing started as early as 1802 and it continued to grow that about a century after Captain James Cook’s arrival in Hawaiʻi, it eventually dominated the landscape. A shortage of laborers to work in the growing (in size and number) sugar plantations became a challenge. The only answer was imported labor. Concerned that the Chinese had secured too strong a representation in the labor market, the government passed laws reducing Chinese immigration. Further government regulations introduced between 1886 to 1892 virtually ended Chinese contract labor immigration. About this time (1866,) Robert Walker Irwin, at the age of 22, arrived in Japan to head the Yokohama office of the Pacific Mail Steamship Company. In 1867 the company launched the first regular trans-Pacific steamship service fulfilling a contract with the US government to provide monthly mail service between San Francisco and Hong Kong via Yokohama. Irwin (January 4, 1844 – January 5, 1925,) great-great grandson of Benjamin Franklin, was born in Copenhagen, Denmark to former Pennsylvania politician (Mayor of Pittsburgh and member of the US House of Representatives) and United States Chargé d’affaires to Denmark William W. Irwin and Sophia Arabella Bache Irwin. He was later hired to work for the Mitsui business conglomerate and cultivated a number of business and government contacts in Japan becoming acquainted with Japanese Finance Minister Masuda Takashi in 1872. He also became good friends with Japanese Count Kaoru Inouye, who had toured the United States with Irwin in 1876 and became a major force for modernization within Japan. Later (1880,) the Hawaiian consul general to Japan, Harlan P Lillibridge, took a leave of absence and Irwin was appointed to replace him; the appointment soon became a permanent one. In March 1881, King Kalākaua visited Japan during which he discussed with Emperor Meiji Hawaii’s desire to encourage Japanese nationals to settle in Hawaiʻi. Focused on Japanese immigration to support Hawaiʻi’s sugar labor needs, and not wanting to repeat the mistakes of the gennenmono episode, Irwin’s friendship and close relationship with Inouye smoothed negotiations; and in 1885 and the first legitimate Japanese immigration to Hawaiʻi occurred. Irwin arranged for and accompanied the first 943-government-sponsored, Kanyaku Imin, Japanese immigrants to Hawaiʻi who arrived in Honolulu aboard the Pacific Mail Steamship Company City of Tokio on February 8, 1885. After returning to Japan, Irwin received government approval for a second set of 930 immigrants who arrived in Hawaiʻi on June 17, 1885. With the Japanese government satisfied with treatment of the immigrants, Irwin was able to conclude a formal immigration treaty between Hawaiʻi and Japan on January 28, 1886. The treaty stipulated that the Hawaiʻi government would be held responsible for employers’ treatment of Japanese immigrants. Irwin was the single most important figure in starting the official labor migration from Japan to Hawaiʻi in 1885. The Kanyaku Imin immigration system that Irwin negotiated concluded in June 1894 with 29,339 Japanese nationals having immigrated to Hawaiʻi. This government-sponsored immigration was quickly replaced with private immigration. In 1891, Irwin purchased a summer home in Ikaho. The residence is a designated Historic Place and is open to the public as a small museum to the Irwin family and Japanese immigration to Hawaiʻi. Irwin died January 5, 1925 and is buried at Aoyama Cemetery, Tokyo. 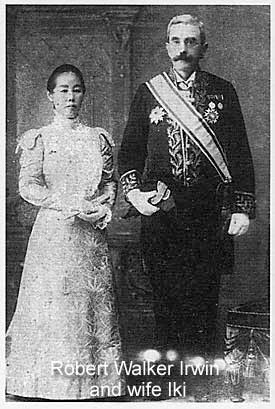 The image shows Robert Walker Irwin and wife Iki formally dressed during a visit to the Imperial Palace for an audience with the emperor. In addition, I have added other related images in a folder of like name in the Photos section on my Facebook and Google+ pages. Mahalo for this very interesting post. I’d love to visit the summer house in Gunma sometime. Do you know of any Hawaii-related sites (such as the former site of a Kingdom of Hawaii consulate or legation) in Tokyo or Yokohama? Thanks so much!